Thermal detectors play a key role in astronomy, perhaps most notably at far-infrared to mm-wavelengths where continued advances have, on-average, caused focal plane sensitivities to approximately double each year over the last 50 years. These technological advances have driven new scientific results on star formation, the cosmic infrared background (CIB), and cosmic microwave background (CMB), with new measurements poised to make significant advances in our understanding of galaxy formation, cosmic reionization, neutrinos, dark energy, and inflation. I will review the development of thermal detectors over the last 20 years; from hand-made absorber-coupled bolometers using neutron transmuted doped (NTD) germanium semiconductors; to superconducting transition edge sensor (TES) bolometer arrays made entirely using thin-film deposition and optical lithography; to superconducting antenna-coupled arrays integrated with micro-strip and filter technology. Finally, I will discuss the design of new detectors for planned and potential next-generation CMB experiments, and low-resolution optical and mm-wavelength spectrometers. Cosmic microwave background (CMB) polarization is the ultimate probe of primordial gravity waves in the early universe, via the B-mode (or parity odd) signal on degree angular scales. A detection of such a signal would provide strong evidence of the inflation scenario and constitute the first observational connection between quantum physics and gravity. In this talk, I describe three experiments with very different instrumental architecture: QUIET, ABS, and MuSE, a novel B-mode experiment using highly multimoded detectors. In particular, I will discuss how the proposed multimoded architecture can attain competitive sensitivity and polarization systematics control, and complements the development of single-mode bolometers. The diverse approach in the instrument development is critically important in order to detect the subtle B-mode signal with the instrumental systematics and the galactic foregrounds well understood. Recent advances in detector technology have enabled precision studies of the Cosmic Microwave Background and many sub-mm sources; however, resolving the majority of the galaxies at z>6 responsible for reionization remains a challenge. One promising means of studying this population is through spectroscopic surveys of 158 um [CII] emission redshifted to mm wavelengths, either through pointed observations of individual galaxies or in tomographic maps of unresolved sources. These observations will require sensitive multi-object spectrometers such as SuperSpec. SuperSpec is a novel, ultra-compact spectrometer-on-a-chip for millimeter and submillimeter wavelength astronomy. Its very small size, wide spectral bandwidth, and highly multiplexed detector readout will enable construction of powerful multibeam spectrometers for high-redshift observations. SuperSpec employs a filter bank consisting of planar, lithographed superconducting transmission line resonators. Each mm-wave resonator is coupled to a lumped element, titanium-nitride Microwave Kinetic Inductance Detector (MKID). I will discuss the design and optimization of the mm-wave circuit and MKIDs as well as measurements of laboratory prototypes. I'll also describe the ongoing development of several experiments which employ this technology, including a two-pixel demonstration camera currently under construction and a proposed multi-object spectrometer for the CCAT telescope, X-Spec. Advances in superconducting Transition Edge Sensors (TES) are enabling new measurements relevant for understanding the Cosmic Neutrino Background (CvB). I will discuss how TES technology is enabling indirect measures of the CvB through ground-breaking measurements of the Cosmic Microwave Background (CMB) radiation with the South Pole Telescope (SPT), a 10-m mm-wave observatory at the geographic South Pole. In 2011, the SPT completed a 2500 sq deg survey using a TES bolometer focal plane. The unprecedented combination of sensitivity, area, and resolution of this survey enables an exciting program of cosmological measurement. Among the spectrum of new cosmological results are interesting insights into the existence and properties of the CvB. TES detectors are also the core technology for the SPTpol instrument, a CMB polarimeter recently deployed on the SPT in 2012. I will provide an update on the performance of SPTpol and discuss its potential for probing the CvB via measurement of the elusive CMB ''B-modes.'' I will also outline plans for SPT's third generation TES-based focal plane, SPT-3G. Measurements by SPT-3G will explore the CvB at a level that is potentially relevant for understanding the neutrino mass hierarchy. Finally, I will discuss a new implementation of TES detectors as part of the PTOLEMY (Princeton Tritium Observatory for Light, Early-universe, Massive-neutrino Yield) experiment. PTOLEMY will detect CvB neutrinos through capture on Tritium providing a direct measure of the CvB. The rapid progress in millimeter and submillimeter astronomy over the past decade has been driven by our ability to deploy large imaging arrays of background noise limited detectors. I will discuss how the degree-scale Keck Array has ridden this detector-driven boost in sensitivity to become the most sensitive CMB-polarimeter in operation, uniquely positioning it to place unprecedented constraints on inflation. Over the next year, additional small aperture cameras in SPIDER and BICEP-3 will come online with similar sensitivity and the ability to spectrally discriminate foregrounds from the CMB. I will further discuss how larger aperture experiments such as SPT and Polarbear will scale up their detector count through multichroic pixels. This technology will let them measure weak CMB lensing in a way that complements the Keck Array/BICEP-3 while additionally constraining the Dark Energy equation of state and the mass hierarchy of the neutrinos. I will conclude with a description of how these multichroic pixels could be naturally extended to allow us to probe the epoch of reionization through tomographic mapping of CII emissions from that era. High-resolution imaging spectroscopy in the soft x-ray waveband (0.1-10 keV) is an essential tool for probing the physics of the x-ray universe. Unique line diagnostics available in this waveband allow transformative scientific observations of a wide array of sources. For example, measurements of turbulence in the intra-cluster medium of galaxy clusters can be used to calibrate hydrodynamic simulations used in cosmology; and measurements of outflow processes from supermassive black holes may identify the key mechanism that regulates the co-evolution of host galaxies and their central black holes. I will introduce the microcalorimeter, a low-temperature detector capable of x-ray photon counting with high spectral resolution, and I will talk about the scientific potential of upcoming space-based experiments using arrays of such detectors, including the Soft X-ray Spectrometer, a pioneering microcalorimeter instrument that will launch aboard the Japanese-led Astro-H mission in 2015. I will discuss our recent advances using transition-edge-sensor microcalorimeters, including new insights into the operational physics of these superconducting-based devices; breakthroughs enabled by using novel device architectures; and the first demonstrations of kilopixel detector arrays. Finally, I will identify areas in detector, readout, and instrument development that are important for next-generation instrumentation for space- and laboratory-based experiments. Gemini Observatory's director Markus Kissler-Patig will present an update of the facility and introduce some new opportunities for astronomers at Gemini. 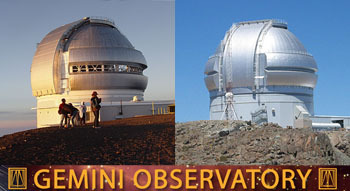 Gemini operates twin 8-m telescopes, one in Hawaii and the other in Chile. The departure of the UK from Gemini's international partnership at the end of 2012 provided the chance to re-evaluate the services offered to Gemini users and opened new opportunities in two domains. First, Gemini will welcome discussions with groups wanting to bring their own instruments for campaigns. This visiting instrument program will complement the suite of workhorse instruments offered by the Observatory, and will allow scientific breakthroughs not possible with the regular suite of instruments. Second, the Gemini Observatory will be offering cross-partnership large or long programs. From 2014 on, Gemini will be dedicating 20% of Gemini time to high-impact large or long collaborative programs selected through a yearly call. Gemini is also looking at the possibility of offering some fraction of time in a fast turn-around mode, as well as "eavesdropping" for ueue observing. We remain very interested in having astronomers visit the telescopes. In addition to these two major initiatives, several new instruments have appeared in 2013: Flamingos-2 and the Gemini Multi-conjugate adaptive optics System (GeMS) are being offered for science, and the Gemini Planet Imager (GPI) has arrived on Cerro Pachon. We encourage all astronomers to attend this presentation to learn about these new opportunities, and to provide feedback how the Gemini Observatory can optimally support your research.